It has been a crazy week so far. Busy as usual - just a normal week except for an emergency dental appointment on my behalf - but with K. gone for most part of this week things have been a little wild for me. Today he'll be back, though! Everything back to normal...sort of. The girls have busy calendars right now - with sports events dominating last weekend and birthday parties the weekend to come - three to be precise (good two of M.'s friends have decided to have their parties together!)! So, we'll be busy wrapping presents the next few days. We got all of the presents yesterday, so that's a good thing, and the girls will take care of the wrapping. They like to do this themselves. They love to decorate their friends' presents and to write little messages on them. I always keep a stock of (colored) plain wrapping paper or craft paper at hand. With that and colorful markers they come a long way in giving the presents a little personal touch! A couple of times I've also sewn a fabric bag to wrap the presents in. And that's exactly what I've been doing yesterday evening for H.'s best friend, whose birthday is coming up next Sunday. H. made a portrait, which I scanned and reduced and then printed on - yes, you've guessed it - iron-on transfer paper (I didn't forget to mirror-print this time - isn't that amazing?!). The result you can see above. I'm actually really pleased with the way it turned out. 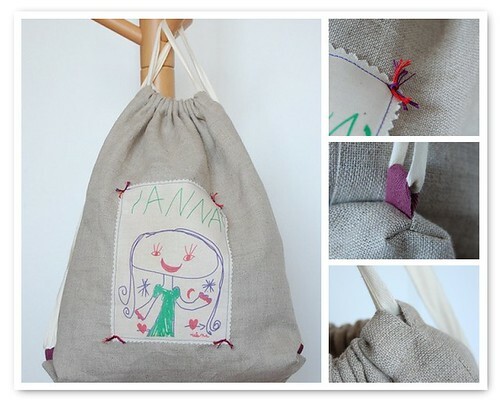 Making a drawstring bag like this is fairly easy. What makes this one special are the details, not in the least the nice portrait H. drew. She used opaque pigment markers which I got a long time ago. They're meant to be used on terracotta, tile, wood... but we've used them for many other "applications" as well, like decorating wrapped up presents... and now this portrait. They have this velvety look, almost like when using soft pastels, only they don't rub off like soft pastels do. And because of their opacity they are extremely well suited for scanning pictures, I noticed. Something to remember.